History text books have always been biased on revolutionaries. Very less was mentioned about the Indian revolutionaries whose martyrdom got hardly any space in hearts of Indians. As students, we mugged the history chapters only to qualify in exams. We read about a revolutionary named ‘Kalpana Datta’ in our history book, but rarely cared to know who she really was. Neither our teachers were interested to explain more about sacrifices of patriots nor were we keen to enquire about it. Kalpana Datta was the surviving member of Surya Sen’s group who knew every intimate details of bloody battle of Chittagong Uprising. This great patriot breathed her last on 8th February 1995. Prior to her death, Kalpana Datta had narrated every minute detail of Chittagong Uprising to her daughter-in-law Manini Chatterjee. This narration became an inspiration for Manini to write a non-fiction novel – Do and Die: The Chattagram Uprising (1930-34). This book is not just a reminder of Chittagong Uprising, but also on the struggle of teenagers and their brave leader Surya Sen who single handedly defied the mighty British Empire. Very few comrades survived in this uprising including Kalpana Datta. May be Kalpana survived so that she can re-tell the sacrifice behind the Chittagong revolt. After qualifying in matriculation exam, Kalpana enrolled at Bethune College for Science stream. Like every patriotic Indian, Kalpana too had a desire to fight for independence. She actively joined Chhatri Sangha, a small revolutionary group which gave her an opportunity to plunge herself in freedom struggle. Here in this group she bonded with Pritilata Waddedar and Bina Das. It was Pritilata who introduced Kalpana to the great freedom fighter of Chittagong – Surya Sen. Fondly known as ‘Masterda’ , Surya Sen was calm by nature, but had a tactical mind like a spy. Initially Surya Sen was reluctant to accept Kalpana in his group, but Kalpana’s die-hard patriotism impressed him and thus Kalpana became an active member of his group. Her tasks involved transportation of explosive materials and other supplies. She was also expert in making gun cotton. Surya Sen’s strategic attack on British’s armory, telegraph office and railway lines cut off Chittagong from the rest of India. This attack was a blow on the British supremacy. This revolt was popularly known as Chittagong Uprising. But Surya Sen’s army couldn’t face the large battalion of British at Jalalabad hills. Several innocent teenagers were shot down by British soldiers. To avenge the death of Jalalabad encounter, Kalpana Datta and Pritilata were chosen to attack the European Club. But unfortunately before the execution of this action, Kalpana was arrested. Thus Pritilata took the task of attacking the European club which later ended with tragic death of Pritilata. (To avoid being arrested, Pritilata swallowed cyanide). The news was a tragic blow for Surya Sen and his group. Kalpana had lost a great friend in Pritilata in whom she confided her feelings. Very less is written about Kalpana’s feelings for her mentor Surya Sen. She had an unspoken soft corner for the widower ‘Masterda’. Though she had expressed her affection to Surya Sen, Surya Sen never approved of her affection. For Surya Sen, his love for nation was greater than any affection. Sadly, there is no mention of this tender story in any article. On 17th February 1933, the hideout of Surya Sen was revealed to British Officials by one of the members in Surya Sen’s group. Though Kalpana and other fellow members managed to escape, but Surya Sen was arrested. Surya Sen was later tortured severely and hanged to death on 12th January 1934. Arrest and later life – Kalpana was arrested on 19th May 1933 and sentenced to transportation of life. Later Kalpana was released in 1939. She later got married to Puran Chand Joshi, the general secretary of Communist party of India. She was blessed with two sons – Chand Joshi & Suraj Joshi. It was Chand Joshi’s wife Manini who later wrote the novel – Do and Die: Chattagram Uprising. It was Kalpana Datta who provided every intimate detail on the fellow members of Chittagong Uprising and the tragic martyrdom of her members – her dear friend Pritilata Waddedar and Surya Sen, the mastermind of Chittagong revolt. Sadly there is no full-fledged biopic on struggle of Kalpana Datta or any Facebook page dedicated to her patriotic spirit. 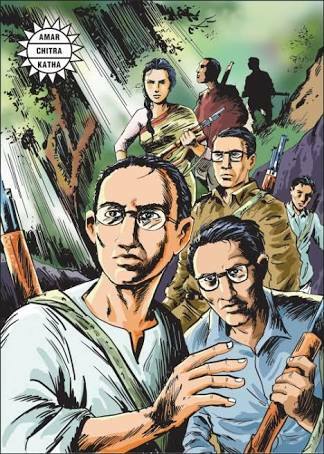 Recently Amar chitra katha comics had published a 32 page comic on life of surya sen in 2010. Since the comic book was based on surya sen, kalpana datta’s description was very little in the story. I wish someday Amar chitra katha comes with a book on kalpana datta and pritilata. Though Kalpana Datta is no more, her valor, indomitable spirit and patriotism is definitely inspiring. The role of Kalpana Datta was portrayed by actress Deepika Padukone in movie – Khelein Hum Jee Jaan Sey which was based on Chittagong Uprising. Through this article, I have taken a small, humble effort to tell the untold story of Kalpana Datta who left a remarkable mark with her revolutionary actions. Apart from Kalpana Datta, Subodh Roy (Jhunku) and Binod Bihari Chaudhary were two other surviving comrades who had closely participated in Chittagong armory raid under the leadership of Surya Sen. I will be definitely telling the story of these two comrades in my upcoming blog posts. Kalpana Datta, Surya Sen and Pritilata Waddedar paid a heavy price for freedom by sacrificing not just their happiness, but also their life. Today the system is ruined by power-hungry politicians, corrupt officials and manipulating businessmen. Is our patriotism just limited to standing up for national anthem in multiplexes? Have we betrayed the sacrifice of Kalpana Datta? Nation really needs die hard patriots like Kalpana Datta, Pritilata and Surya Sen.
Another amazing sneak-peek into the life of an almost forgotten revolutionary…both your write-ups on the Chittagong raid, Prashant, capture the detail as well as the actual feel of revolution in those times. Brilliant and very well-researched. Masterda Surya Sen,Kalpana Ji and all other 64 Youngsters are always being an Inspiration for every Indian.However we got Independence from British Government but the fact is that we are still not dependent.We are under Corruption,Crime,Illiteracy,Poverty,Discrimination and inequality which is more dangerous than British.It’s now the youth need to be follow the footsteps of Masterda Surya Sen and try to protect our Motherland India.It’s my appeal to all our citizens that please this is the right time to stand against all Odds and fight for corruption Like our Masterda did. Very nice and much needed article to prove bengal not only provided good revolutionary men but women were equally equiped, brave and courageous to be a patriot. Thanks for your comments Debopriya. Kalpana Datta was a great revolutionary who never got the due for her contribution towards freedom struggle. She is just a forgotten hero in the pages of history. Really sad to know that great women revolutionaries like Kalpana Datta and Pritilata Waddedar are slowly diminishing from the memories of today’s generation. Today’s young masses know about American and French History, but are clueless about Indian history. Sharing my article on Pritilata Waddedar on this comment. Please do read. Today we need great revolutionaries like Kalpana datta and Pritilata. Well written, we need people like you too to remind us about our past.